Some of you might be wondering why I don't update this site as often as I used to. To that question, my only answer is that I've been looking for work (which, as they say, is a job in itself). Although I was looking in the graphic arts and prepress field, where I have some reasonable, real-world experience, I was lucky enough to land a job where, in addition to that, I'll actually have some possibility of using my 3D knowledge—and Blender. Most of the time I still pretty much battle with Illustrator files, PDF output, and plate generation. I like working with Illustrator, so that's really fine by me. However, as I said, I am also starting to do some 3D related work, mostly product visualization. Right now I am working on a product shot scene that takes full advantage of Blender particles and Cycles rendering capabilities. Anyway, the company owns a copy of a 3D package I had never had the chance to use before: Strata Design 3D. I have started learning it, and so far my conclusion is that it probably has the best interface of any 3D package I've ever worked with (Blender, Cheetah3D, Maya, modo, Cinema4D, ZBrush, DAZStudio). 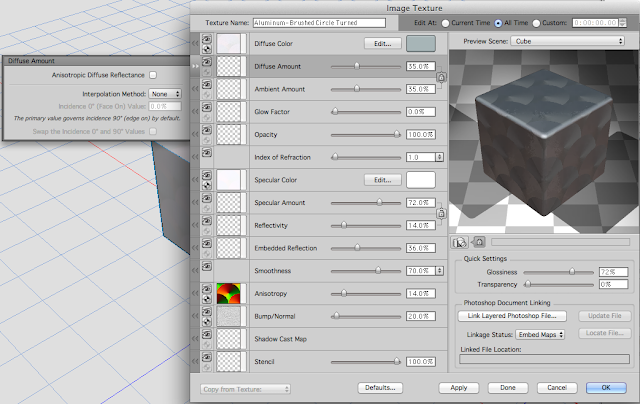 Many keyboard shortcuts in Strata Design 3D are very similar to those associated with Illustrator or Photoshop. For example, to move around the scene, you just press the space bar and drag (as in Illustrator/Photoshop), and to zoom in and out you add the Command or Command-Option keys to that (I work on a Mac after all), again like Illustrator/Photoshop. 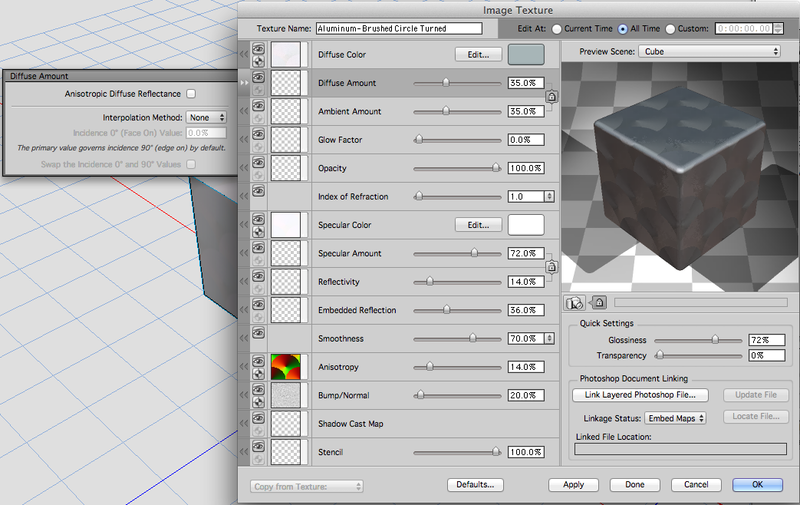 Another example is Option-drag to copy elements in the scene—finally a 3D program that gets it! The great thing is that there is, strictly speaking, no selection tool. Every tool (for example, move, rotate, scale) lets you select. Also, if you Option-drag an object with, say, the Rotate Tool selected, you'll rotate around the object's origin (or whatever origin you set) while duplicating. Blender's use of the Shift-D key combination to duplicate and immediately pressing one of the basic editing tools (G, S, R for grab, scale, rotate) is the only thing that can match Strata's speed while performing this simple task. One other great user interface feature is the use of expandable side-tabs next to the options in some of the palettes—like the Image Texture palette (see figure 2). This arrangement manages to pack incredible amounts of easily accessible functions without cluttering the screen. Whoever designed Strata's user interface was paying attention. Anyway, I still have a lot to learn about Strata, a deceivingly simple program that seems to have very powerful features. Right now I'm learning about material setup, lighting, global illumination, and efficient render settings. I'll try to keep you posted with my progress (not much to show yet). Here are two screenshots of the program's UI. The first one is the minimalistic, context aware, and extremely useful Tool Palette. The second one is a screenshot of the Image Texture palette, perhaps the best organized material setup window I've seen in a 3D program. Great job! Figure 2. The Image Texture palette (or window?). Notice the side tab (Diffuse Amount) on he left, that expands when you click on the double arrow below the eye on the far left of the highlighted Diffuse Amount context. Very efficient arrangement! I'd be interested to know how you're getting along with Strata since posting this. I own Strata but I find it a little rigid to work with (hopefully you'll understand what I mean). It's certainly a capable renderer though! Strata was the first 3d program that I learned. But Blender is so much better and its free!!!! For me this program is a powerful and simple application 3D with a smooth line learning. Simpler than other complex software (Cinema 4D, Lightwave, Maya ...). Excellent in ambient lighting, rendering extraordinary. This software is very little known but as Andreu said, it is misleading. I have worked with Cinema 4D, Lightwave, Maya... Conclusion: If you design product (no animation) and for you is important to render quality, strata is just perfect.